The ESP Next Gen is a professional-grade surge protector/noise filter that also incorporates real time power monitoring so you can track the quality of the electrical power in your home or office. The Next Gen offers very powerful protection from the damage and downtime caused by electrical surges, spikes, over voltage, under voltage, EMI/RFI noise and wiring faults. With Next Gen you can monitor, manage and diagnose power issues. Your purchase Includes FREE downloadable software that allows you to display power quality information on your computer screen. An optional interface cable (part #XG-PCS-IC-1), available separately, is required to view or download data to a PC. The software is PC only. It is not compatible with Apple products. The XG-PCS-20D features Cat5e ETL verified network (RJ-45) protection to keep electrical disturbances from entering your equipment via the network cable. It also includes fax/telephone line (RJ-11) protection. Unlike standard surge protectors and power strips that offer limited protection (often using only metal oxide varistors (MOV)), the Next Gen combines gas tubes, silicone avalanche diodes and metal oxide varistors into a patented circuit that does not degrade over time and provides very robust protection. The ESP Next Gen is used by many of the world's leading technology companies to safeguard their electronic equipment, optimize performance and protect against data loss. ESP products feature a lifetime warranty on the product and a 5 year, $100,000 connected equipment warranty. Like all ESP products, the Next Gen is proudly made in the USA. 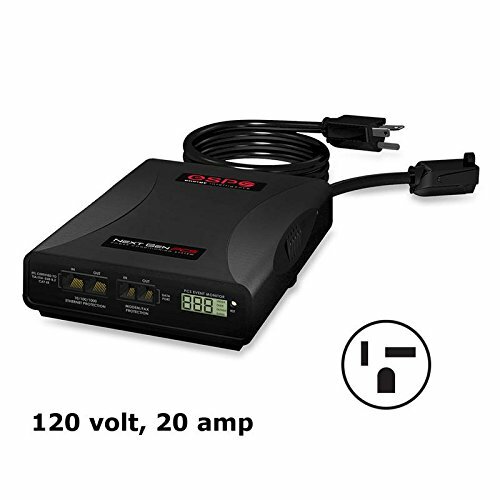 The XG-PCS-20D is designed for 120 volt, 20 amp electric circuits. It has a NEMA 5-20P plug, (1) 5-20R outlet and (2) 5-15R outlets. This model will not work with a standard household (15 amp) circuit. Industrial-grade surge and noise protection. Protect sensitive electronics from lightning strikes, surges, transients, noise, over voltage, under voltage and wiring faults. Special filter circuits screen electrical noise to prevent disruption, data loss and phantom problems. Automatically disconnects from the electrical supply in the event of dangerous situations like extended over and under voltage conditions. (RJ-45) network protection and (RJ-11) phone line protection prevent power disturbances from entering your equipment through the communications network. Monitor, manage and diagnose power issues. Includes FREE downloadable software to display power quality information on your computer screen. An optional interface cable (part #XG-PCS-IC-1), available separately, is required to view or download data to your computer. Note: PC only. Apple is not currently supported. Lifetime product replacement warranty. $100,000 5 year connected equipment warranty.